Michael J. Garcia, Governor Andrew Cuomo's sixth nominee to the seven member Court of Appeals, New York's highest court, is Cuomo's first Republican selection. Garcia's stellar credentials and his party affiliation make his confirmation by the Republican led Senate a virtual certainty. Hopefully, however, the Senate--and more specifically, the Senate's Judiciary Committee--will still exercise its constitutional "advice and consent" responsibility conscientiously. Hopefully, it will actually examine the Governor's choice, do so rigorously, and render an informed, independent judgement. 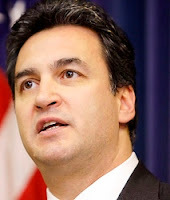 Let's outline Michael Garcia's professional background and experience, and then consider the kind of inquiries that would be worthwhile for the Senate in assessing the qualities, character, and overall fitness of a Court of Appeals Judge Garcia. Generally, his view on consensus versus dissent? How will his experience as a federal prosecutor, and as one with a reputation for being zealous, influence the kind of Judge he will be? Specifically regarding his having been a federal prosecutor, what is his understanding of the different roles of state and federal law, of state and federal courts, and most importantly, of the Court of Appeals and the U.S. Supreme Court--especially when those courts deal with similar issues under state and federal law respectively? To be sure, there is much more. But for now, here's hoping that the Senate Judiciary Committee does its job today and has a real, substantive hearing--as it did for now-confirmed Chief Judge Janet DiFiore. And here's hoping that Michael Garcia demonstrates that the extremely high regard in which he is held by those who know him and have worked with him is well-earned, and that following the virtually assured confirmation, he will honor the name of the Judge for whom he clerked--Judith Kaye--and will serve with great distinction on our distinguished high court.